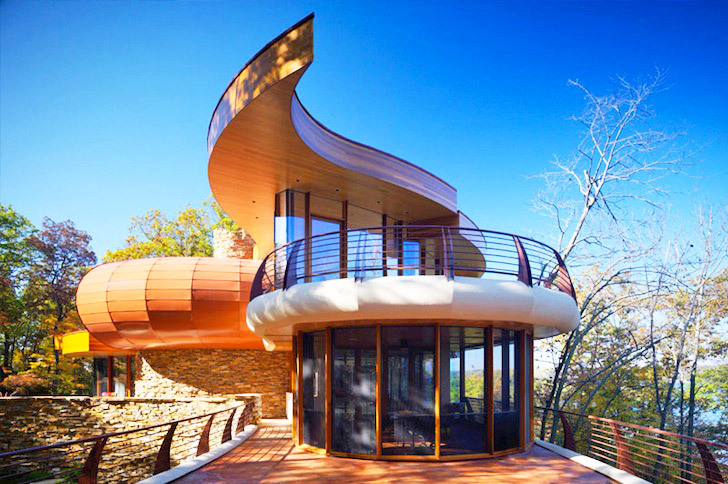 Robert Harvey Oshatz breaks every mold in the book with his latest project - the curvilinear Chenequa residence in Wisconsin. Ranking high among our list of favorite lakeside dwellings and wrapped around a central stone core, this Milwaukee home is hidden by tall trees from afar but looms large and bold up close. Flip through our gallery for a closer look at the interior and exterior shots and hit the jump for more details. The first of two phases, the primary Chenequa residence will soon be followed by an additional structure for visiting grandparents and an enclosed swimming pool. Meanwhile, working around the existing landscape, Robert Harvey Oshatz made extensive use of natural materials, glazing and curvilinear forms to create a well-lit lakeside haven that celebrates nature at every turn. The interior is organized around a central atrium anchored by a solid stone wall, and a spiraling hemlock-clad roof “sweeps over the entry and lifts the upper floor before disappearing from view,” according to the designers. Stepped roofs overlook the lake and the interior, albeit bespoke and more costly than most people can afford, is adorned with a humble, minimalist touch. my primary response is the overwhelming thought of 'snow removal'...all those flat surfaces! 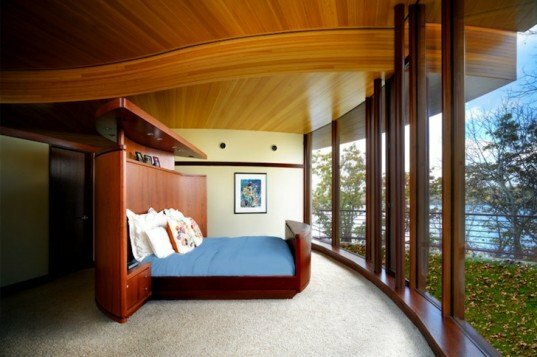 We love the unusual dynamic form of the house.